This is so simple, so straightforward, that at first, I felt I couldn’t possibly blog about it. But when I wanted to make it again the next day, I realized that I had found something sure to become a regular in my kitchen. So if you’ve made this already, you now have five minutes to browse something else on the web (might I recommend this, this, or this?). If not: let’s carry on. 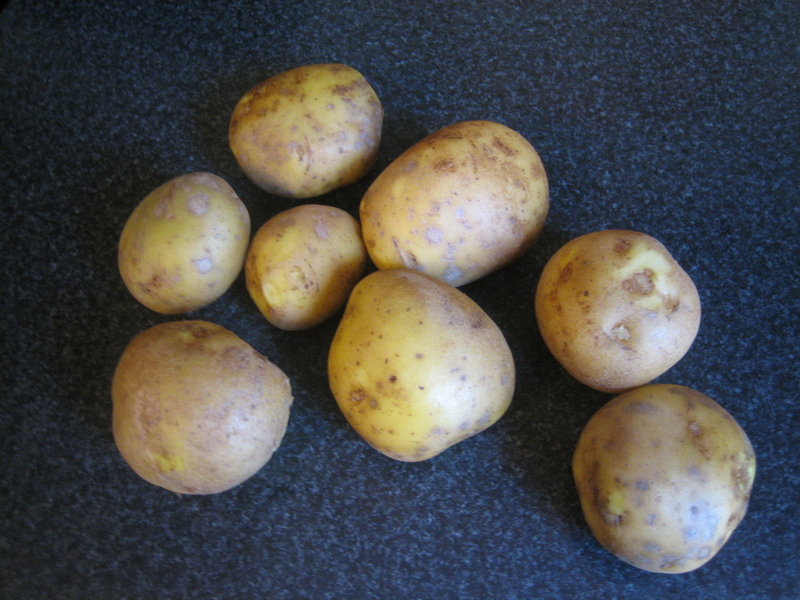 You take your baby potatoes (or new potatoes) and boil them in salted water until tender. Drain. Spread them out on a baking pan, and then smash them with the back of a fork. It’s fun. It’ll let your inner child out and make you smile. And if you actually have a little kid, I’d bet they would love helping with this step. 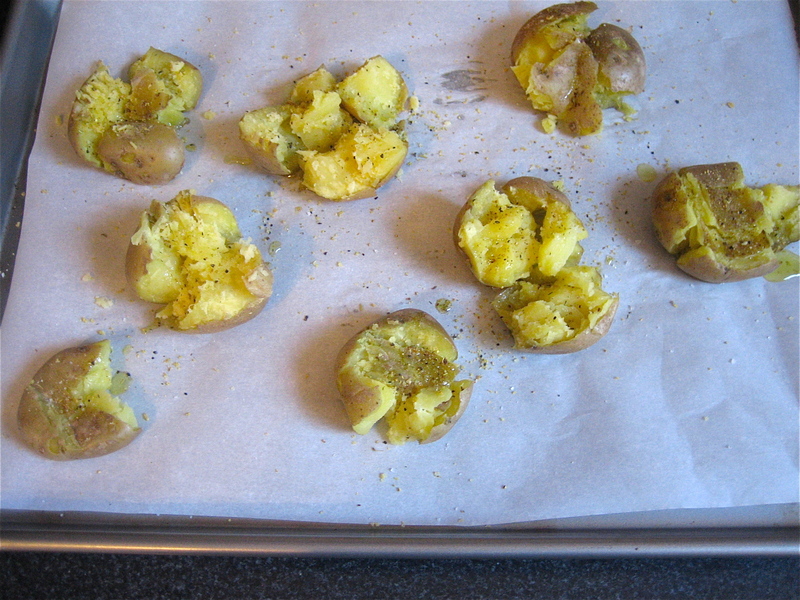 Next, drizzle the potatoes with olive oil, salt and pepper, sprinkle with herbs, and into the oven they go. I think potatoes are one of those vegetables that demonstrate the incredible versatility of cooking. Armed with just potatoes and the most basic of seasonings, there are so many ways you can go- from classic French fries, to mashed or baked potatoes- each one boasts a completely different flavor and texture profile. And if you’ve never had smashed potatoes, you’re in for a real treat: the skins crisp up, turning golden, the flesh is surprisingly moist and tender, and the craggly ridges across the top add texture and additional surface for gorgeous browning. Smashing them changes the ratio of crisp exterior to moist interior, compared to their untouched baked potato counterparts, and with minimal seasoning, the potato flavor shines through, fresh and clean. Easy has never tasted this good. I think these potatoes, along with a big green salad, would be the perfect accompaniment to steak, roast beef, or roasted chicken. 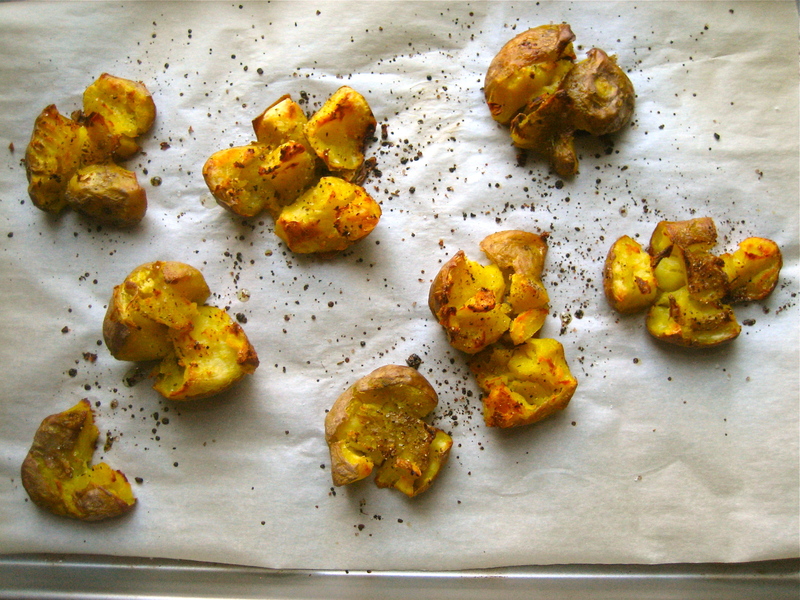 Although last night, we called these- along with a leafy salad and freshly baked naan- dinner. Preheat the oven to 400F/200C. Scrub your potatoes, and boil them in salted water until tender. Drain. Place them on a lined roasting pan. Using the back of a fork, press down on each potato, crushing it slightly, breaking the skin and flesh a little. Drizzle olive oil over each potato, and sprinkle with rosemary. Season with salt and pepper, and roast for thirty-five to forty minutes, until the potatoes are golden and crisp around the edges. *In a pinch I use McCormick’s Lemon Pepper with Herbs. Fresh thyme, dried rosemary or dried thyme would be other good alternatives. ok def making this for dinner tonight looks awesome! We had a really great time making these! The look on the kids face was priceless as i showed them how to smash the potatoes.. they thought it was hilarious! Thanks for the fun activity and delicious dinner!